“Kayak”? ?… This is likely to be the last thing that comes to mind of anyone watching this movie, but indeed, the S4, like all Wavewalk’s patented catamaran boats, is officially designated as a kayak, not just because of its light weight (98 lbs) and high performance as a paddle craft, but mainly thanks to certain design features required by law. Skiff?… The kind of performance seen in this movie is not what you’d expect from a skiff or skiff by name. Wavewalk likes to bring forward the S4’s performance as a skiff, namely a fishing boat for flat water, but there’s no flat water to be seen in this offshore movie… far from that! PWC?… Such comparison would have been more appropriate if we used wheel steering instead of direct steering with the tiller, and possibly an even more powerful motor than the 9.8 HP Tohatsu that features in this movie. Nevertheless, the movie conveys some of the action and excitement associated with Personal Watercraft (PWC), sometimes referred to as jet-skis. This video shows the Wavewalk S4 powered by a 9.8 HP Tohatsu outboard motor, driven at full throttle, offshore, in choppy water and waves. It demonstrates a performance level that’s new in the world of small boats and watercraft, including both unrivaled speed and stability that enables stand-up driving and wave-hopping that one expects to find only in Personal Watercraft (PWC). The Wavewalk design and PWC have one feature in common, which is their similar saddle seats that deliver the best balancing capabilities to the driver and passengers. But the advantage of the saddle seat doesn’t end there – The saddle also allows the driver and passengers’ legs to act naturally as powerful and effective shock absorbers that protect their backs from the unwanted impact of the constant leaps and bounds, and high speed clashes with waves. 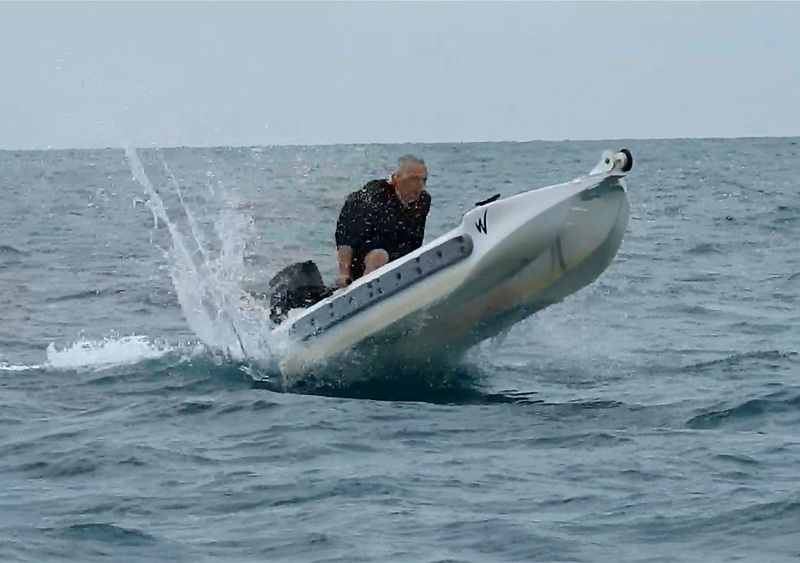 The performance seen in this video is not the kind of performance that flat-bottomed boats such as Jon boats or skiffs can deliver. The S4 is seaworthy, while these traditional small fishing boats aren’t. 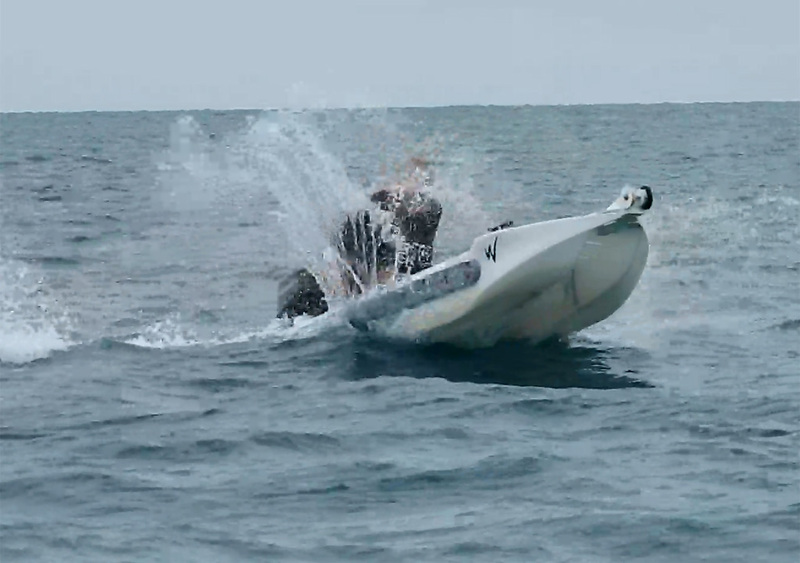 What cannot be well perceived from watching this movie is the fact that the S4 is dry too – Frontal clashes with waves do not let water into its hulls, and the only time when spray gets in is when the boat is hits a wave with its broadside. Even then, very little water gets inside. The cameraman was Captain Larry Jarboe, standing on the deck of his fishing boat, the Line Dancer, that was anchored in the same choppy waters as the S4 is seen going in. The Line Dancer was constantly bouncing and tilting, which made it particularly difficult to shoot video of another, distant and fast moving small boat. Larry used a Nikon Coolpix 900 digital camera with a powerful x83 optical zoom lens, in an auto-focus mode, but since placing this camera on a tripod would have been useless under these hectic conditions, Larry’s sea legs were the decisive factor that helped produce the video footage for this movie. The boat in this movie is Larry’s personal S4, dubbed the White Knight. Larry offers fishing and diving tours in Key Largo, and it is this boat that he uses in these trips, and on a daily basis. The White Knight features a base for a diving ladder at the bow, and foam boards on its sides, since Larry sometimes uses it to side-tow two other S4s,each attached to a different side of the White Knight. 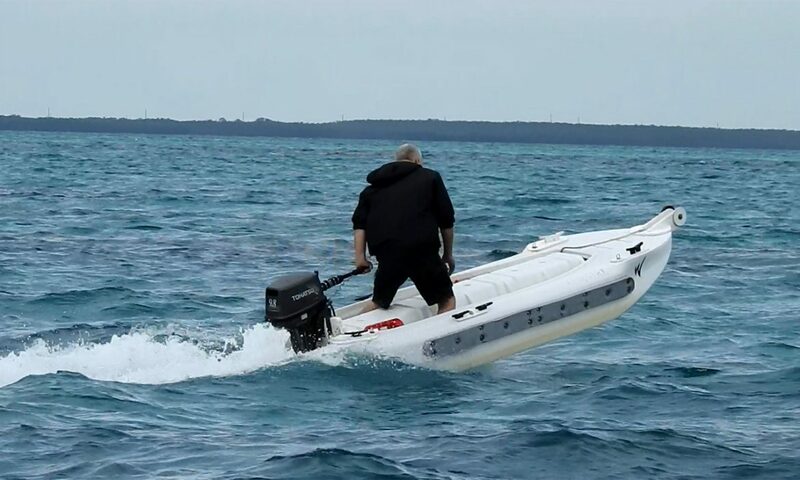 The White Knight is powered by a 9.8 HP 2-cycle Tohatsu outboard motor, and Larry recently clocked 17 mph with it, which is a world speed record for kayaks. Possible future options might include a roll bar and a seat belt. Does it plane on smooth water? Yes, it planes nicely on flat water, naturally. It’s possible to see that it planes in choppy water too, providing the waves aren’t too big. I’ll post a third video in this new series shortly. It shows the S4 with a 5 HP motor and with this 9.8 HP motor, going on flat water. Larry sometimes uses this side-towing mode when he takes a group of clients on a fishing or diving tour. Wow, you sure are having some fun pushing the S4 to show just how stable and dependable it would be if caught out on the water and a storm rolls in fast. It can take that chop with no trouble at all. Those foam boards on the side of the White Knight came from a sheet of polyethylene pad that I recovered from the mangroves. They are especially handy when rescuing disabled boats because, instead of towing astern, I can hip-tow by securing aside the after quarter of a much larger vessel. 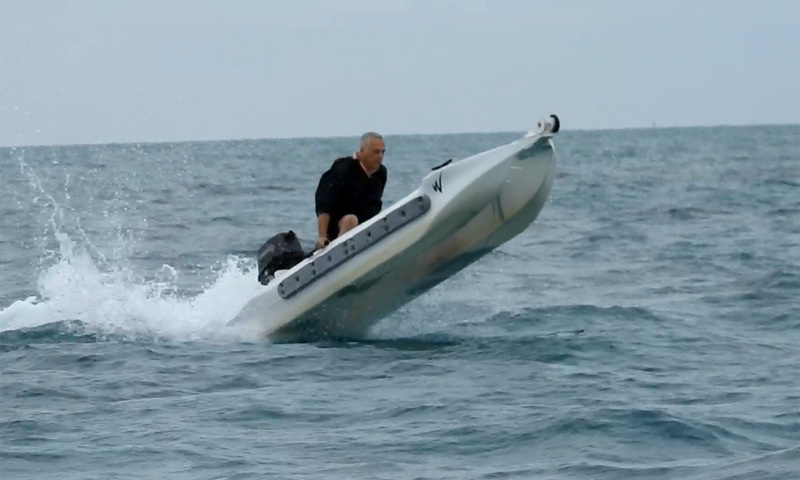 The hip-tow method offers much more control and communication with the other boat’s crew. The 9.8 Tohatsu has enough guts to get a 25+ ft. boat back to the dock in a reasonable time frame. Tandem kayaks are often called divorce boats. However, my wife loves quickly skimming through the mangrove creeks with me at the tiller. There is more than enough power in the 9.8 hp Tohatsu to carry 3 people planing in an S4. But, trying to take my wife and girlfriend might be pushing the limits a little too far. We already have clients who use W700 and S4 boats for technical inspections of harbors, docks, bridges canals and waterways. Attaching two or three S4s together opens a way for carrying on board heavy equipment such as air compressors for riveting, surface cleaning, and refilling scuba diving tanks with air. Other equipment carried on board can be powerful pumps for draining and cleaning, electric power generators, welding equipment, cranes, ladders, etc. The S4x3 (three S4s attached together) can carry a payload of nearly 2,000 lbs, and that’s a lot in terms of people and gear. So what’s the advantage of an S4x3 multi-boat over a big flat-bottomed work boat? The S4x3 is more stable, more seaworthy, more comfortable and more versatile, and it can be transported as 3 separate units (plus the outboard motor) on the truck bed of a large size pickup truck, and launched pretty much anywhere, be it from a beach, a river bank, a street, or a parking lot. There is no problem outfitting an S4x3 with two outboard motors for more power and speed, as well as for precision maneuvering in tight places. 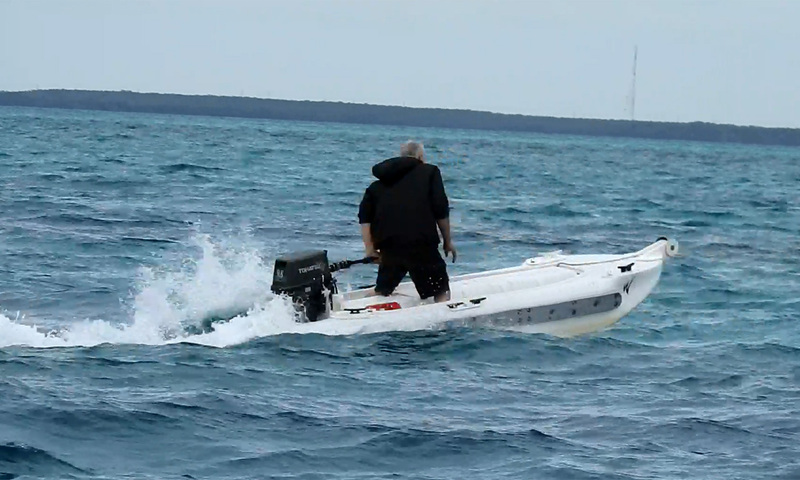 Needless to say that outfitting such watercraft with electric motors is easy. 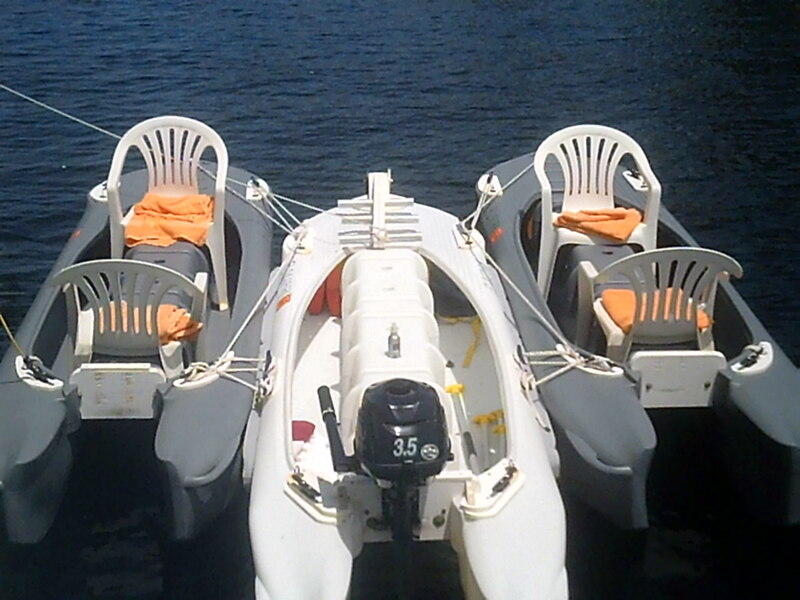 And whether you use a single S4 or combine two or three of them, there is also the option to attach our XL inflatable flotation modules on the sides and the front of your watercraft, and thus further increase its seaworthiness. 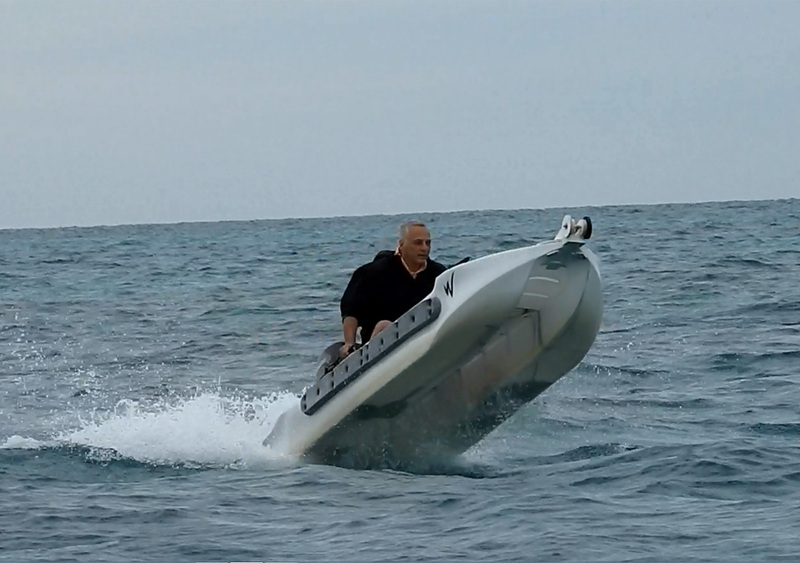 Such rigid-inflatable (RIB) S4 based crafts would be capable of going in very rough seas, and serve as life boats. Another advantage of the S4x3 arrangement is the ability for a someone to get into guiding up to 6 people without the requirement of a USCG operator’s license. My read of the regs is: as long as you do not carry passengers in your guide boat, you are not required to obtain a USCG captain’s license to do business. Kayak guides who assist people in other kayaks have minimal certification requirements. That said, the time you put in operating your S4 regardless of recreational or commercial can be applied toward the 360 day requirement to apply for your USCG 6 passenger captain’s license. A minimum of 4 hours operation per day satisfies the daily requirement. I suggest registering your boat with your state to assist with the Coast Guard certification of days served plus other legal necessities. Many people dream of having their own business on the water. The Wavewalk S4 can make those dreams come true. Over the years, Wavewalk helped many people start their local Wavewalk dealership, and in the last couple of years we’ve concluded that not everyone who dreams of having their own little business has the ability to run one. Besides, dealing with one product line (the W500) was much easier than dealing with three (W500, W700, S4), especially when taking into account motorizing. Even a very small retail and service business requires a high level of commitment, and not everyone can keep up with such a requirement. This is even more important than dealing with the technical and commercial aspects of the business. Not everyone who dreams of having a business is aware of the fact that when you have a business, even a small one, it comes before anything else, or it fails. There is too much competition out there to allow for incompetent businesses to survive, and running a Wavewalk dealership and/or a guide business is not necessarily a simple thing. You have to know what you’re doing, you have to learn new things, and you have to like dealing with people. From our standpoint, having a local dealer who’s dysfunctional is worse than having no dealer at all. I hope all this talk about micro skiffs and micro businesses doesn’t carry over into catching micro fish! I’m after the macros! I could have photographed 20 or so snook while out yesterday. Unfortunately, they were all floating belly up, victims of our latest cold spell. Such a shame, just as they were starting to recover from a massive die-off in 2010.